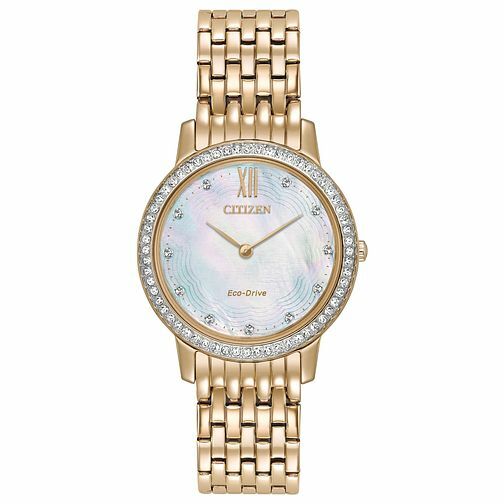 This stunning stone set ladies' watch from Citizen is elegant and classic in its design, and has enough sparkle to light up any room. Featuring a gold plated stainless steel bracelet and stone set bezel, this watch creates a dazzling impression wherever it is worn. The mother of pearl dial has stone set hour markers, a gold Roman numeral 12-hour marker and gold time hands, making this watch exquisitely elegant and ideal for those occasions you need to make the perfect impression.